As the culminating event of the First-Year Institute (FYI) Digital Storytelling Project, Walsh University hosted its first Film Festival on Wednesday, November 14, to honor the creative talents and finished digital projects of Walsh’s freshman class. Mimicking the style and excitement of the Academy Awards, the formal event included a red carpet, oversized Emmy statues and roving reporters. 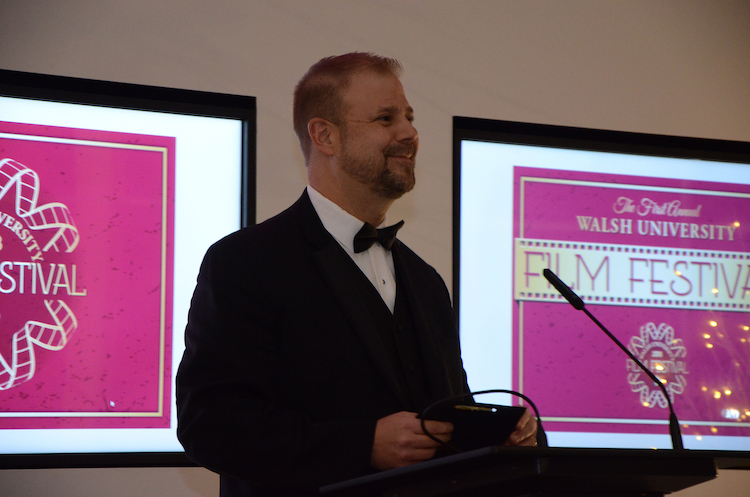 After viewing the 10 semi-finalist films from the pool of Best in Class videos, three finalists were honored for their completed projects with a “Walshie” statue. 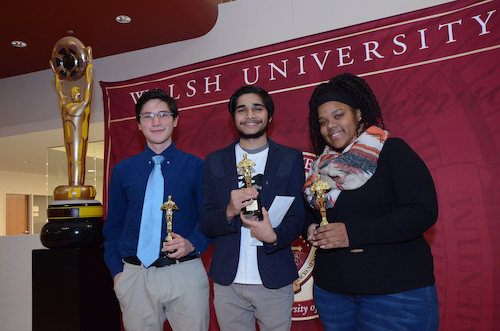 The student team of Oscar Ortega, Sagar Subedi and Passionate Gordon took home the first place award for their animated documentary “Our Walsh Story.” Second place went to the team of Kendall Sarbach, Melissa Dahman, Brielle Therrien for their video "The Blouin Bunch" with third prize to Chance Clevenger for his documentary "Commuter Life." Campus-wide, the Walsh Advantage student recognition program was implemented at the start of the school year to promote the achievements of Walsh students through the awarding of digital badges, an official credential that validates a broad scope of learning not evidenced on a traditional academic transcript. 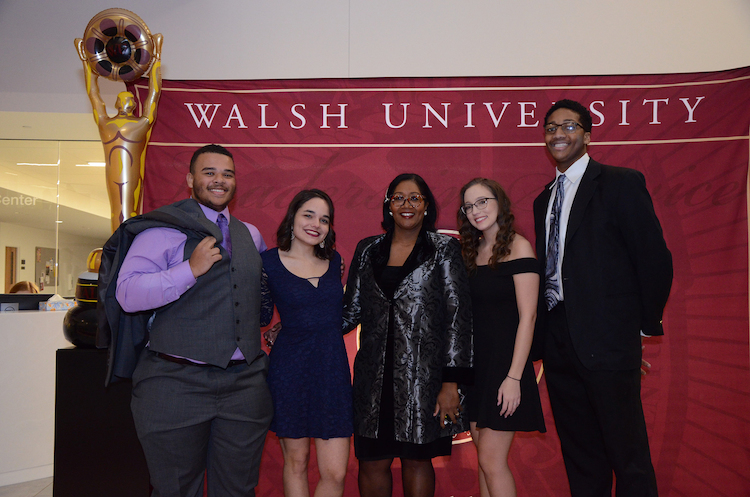 This fall, Walsh first-year students created documentaries about a topic of their choice to earn their first digital badge in Creativity. Utilizing their smartphones, first-year students worked in teams or individually in their GE 100 courses to explore the art of storytelling by creating a video documentary. The Walsh students submitted their final documentary capstone project at the end of the semester. The project kicked-off on Monday, August 27, with creative sessions in the Marlene and Joe Toot Global Learning Center and a discussion with author Dr. Eylem Atakav, Senior Lecturer in Film and Television Studies and internationally acclaimed documentary director. 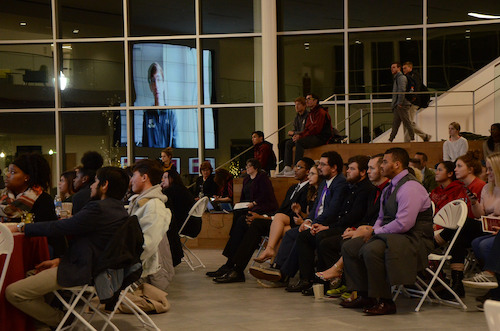 During the Film Festival, Dr. Atakav made a special guest appearance via video, sending her well wishes from London. Digital Badges document a student’s soft skills acquired such as adaptability, engagement, critical thinking, problem solving, and innovation in a student’s undergraduate and graduate education. Digital badges also provide a competitive edge in maximizing a student’s academic and career potential. According to Forbes Magazine (2018), storytelling has been identified as an in-demand job skill that will give students an employable edge over the competition. For more information, visit walsh.edu/merit.